A wrought iron fence combines beauty and utility in a very classy way. It’s versatile good looks can run the gamut from upscale elegant to over-the-top ornate. Wrought iron fencing can also provide many practical advantages. Wrought iron is mixed with a fibrous material called slag so it has a much greater rust-resistant quality than pure iron. It is true that wrought iron can rust eventually, however, a simple paint job every 3-4 years (or a more elaborate one each decade) will keep it looking great. Wrought iron fence is extremely long wearing and strong. It’s known as “100-year fence” because of its durability. It’s also resistant to shock, denting and bending. Pet safety can be a concern here in Las Vegas with our coyote population. Wrought iron fence can safeguard children and pets in your yard (although you will need to choose a style that ensures children can’t jump over and pets can’t slip through). They can also be used as a safety fencing around your swimming pool. Finally, the tallest wrought iron fences are excellent at keeping out intruders. Repairs to wrought iron fence can be accomplished without having to remove the entire fence. 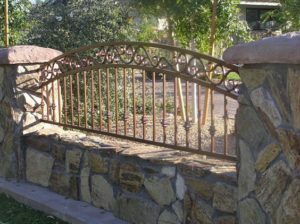 Wrought iron can be shaped into a wide variety of artistic designs to match your personal design style. This type of fence is more than a boundary marker – it’s a design feature. 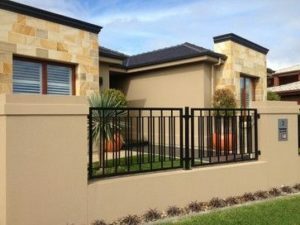 A wide range of styles to complement any home décor can be accommodated with wrought iron fencing whether traditional or modern, formal or casual. You can see through your wrought iron fence. Some may think this is a disadvantage, but if you appreciate a bit of privacy without walling yourself in, you may well appreciate the see-through effect. You won’t be blocking out light or a gorgeous nearby view. When you’re ready to sell your home, the wrought iron will actually add to your home’s curb appeal and property value. Are you ready to talk to one our fantastic estimators to discuss your Las Vegas fencing needs? Just give us a call or fill in our contact form.